A crown is most often placed when the tooth beneath it has become weakened, broken or brittle and might therefore experience greater damage unless it is protected. 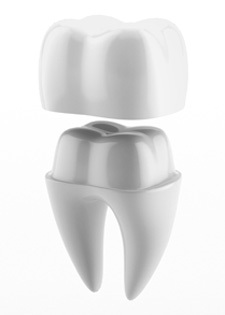 Crowns can also be placed to provide a cosmetic change to the underlying tooth or to support a bridge or denture. Crowns are customised to fit your tooth precisely, and are typically made out of ceramic (porcelain), metal (usually an alloy of gold) or a layering of both. It typically takes two or more appointments to prepare a tooth and then fit a crown: between visits a temporary crown will be fitted to protect the tooth and fill the gap. A dental technician or ceramist will build the crown from scratch, and will work closely with your dentist to ensure that the appearance and fit of the crown is optimal. A dental bridge is one method used to replace a missing tooth. While there are several types of bridges that can be used, the most frequently used is one that positions the replacement tooth between two crowns that are fitted to the adjacent teeth. We do not send crowns or bridges out of the country to be made: this is because it becomes impossible to control the quality and materials of the work in overseas dental laboratories. Sometimes the materials used overseas have not been approved for use in Australia, and we have no control over the training or infection control protocols in non-Australian laboratories. As part of our commitment to providing only quality treatment, we refer all laboratory work to two quality Australian laboratories. To find out more about crowns and bridges, contact us.